ESPN baseball analyst Peter Gammons, 61, is out of surgery and in intensive care after undergoing an operation for an aneurysm in his brain. Gammons was stricken earlier today near his home on the Cape. He was taken to a hospital on the Cape before being air-lifted to a Boston-area hospital. He is expected to be in intensive care for the next 10 to 12 days. Gammons and the Globe were the trailblazers of the baseball notes format in the 1970s. From that time until 2000, save for a few interruptions in the 1980s, Gammons's unique take on baseball was a mainstay of the Sunday Globe's sports section. Gammons was honored as the recipient of the 2004 J.G. Taylor Spink Award for outstanding baseball writing during the 2005 Hall of Fame induction ceremony July 31 in Cooperstown, N.Y. He was selected in balloting by the Baseball Writers Association of America. He began his career as a reporter for the Boston Globe in 1969 and wrote a very popular weekly Sunday baseball column for many years. He has also worked for Sports Illustrated covering the National Hockey League, college basketball and Major League Baseball (1976-78, 1986-90). In 1986, upon his return to Sports Illustrated as a senior writer following a second stay at the Globe, he wrote numerous stories covering some of baseball's most important news events, as well as authoring "Inside Baseball, Sports Illustrated's weekly baseball notebook. 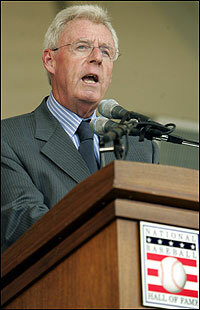 Born April 9, 1945, Gammons is a native of Boston, raised in nearby Groton, Mass. He attended the University of North Carolina and is married.